Can you really get away with being girly over 40? Is girliness after 'a certain age' simply sad? Well... I certainly don't think so! Unless your idea of looking girly is dressing like a school girl, a Disney princess or a Barbie doll then why not? Come to think of it, if you want to dress up as Barbie, then go for that too! Girliness is not just for the (young) girls. Us older girls can dabble too! For me, there is nothing quite as girly as a 'sticky-out' skirt. Especially if it has some structure to it and a nice rustle to the fabric! This skirt has that just-stiff-enough structure and complete crinkle appeal. It rustles as I move and poufs up when I sit down. It is lacking in one thing though... Pockets. This skirt would have been perfect if it had just had a couple of nice deep pockets! Anyone else with me on the pocket front? The skirt felt SO feminine and girly to me that I had to stop things there. The skirt was all the girl I needed to be today! I'm not really a very girly girl at heart. I LOVE the look but uber-feminine styles are best suited to other people. However, that doesn't stop me dabbling with the dark side from time to time! So in order to make this skirt feel 100% me, I kept the rest of the outfit quite simple... and almost androgynous. A fine knitted jumper in a neutral grey... which goes with everything. A denim jacket... which goes with everything too. Simple flat silver sandals... ditto on the going with everything front. 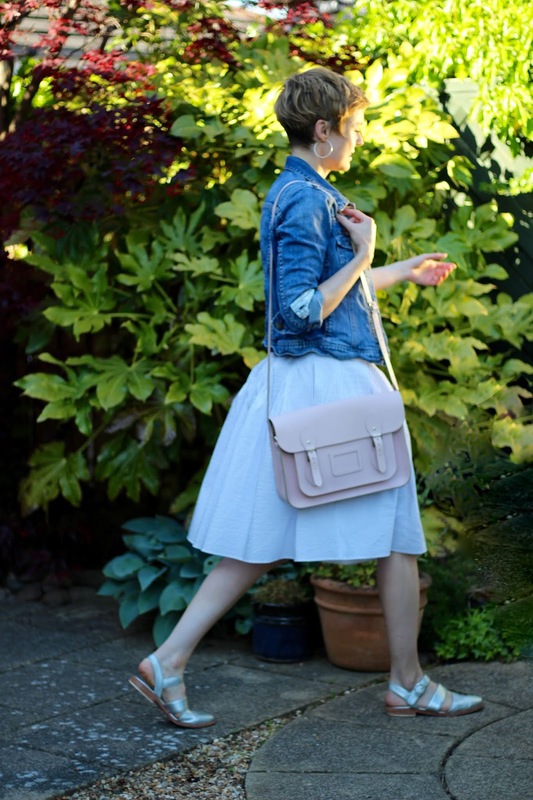 A pink leather satchel and some silver hoops finished things off nicely. JACKET: Boden (very old)... this one is nice, but nearly sold out! SKIRT: Zara (charity shopped)... try this. 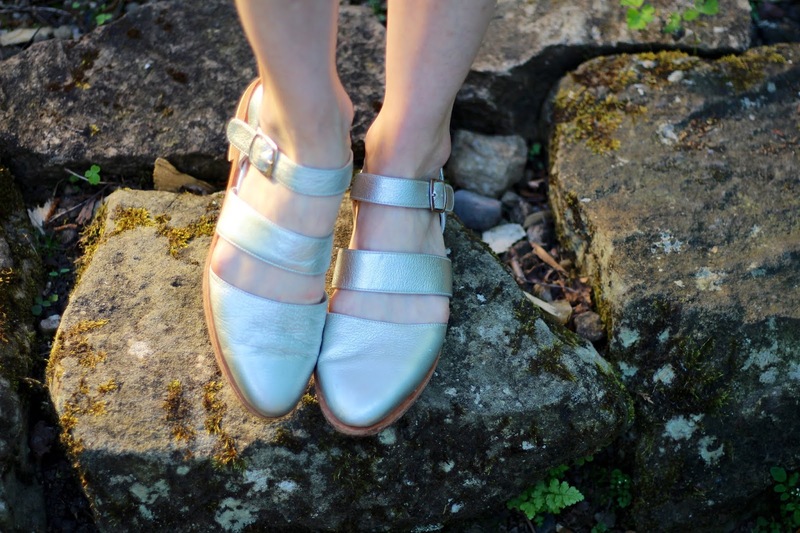 SHOES: American Apparel (old)... these are fab! These are nice... and much cheaper. 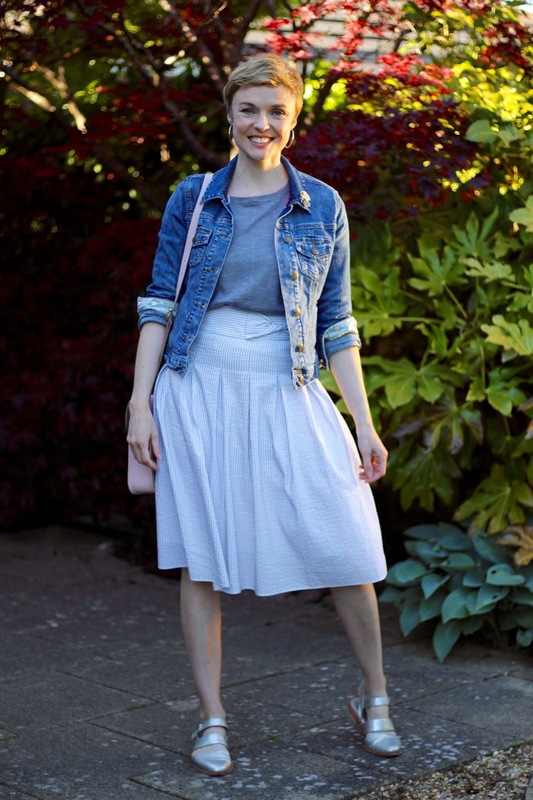 I love this look, and while yes, it's a foofy poofy skirt, because you've "tamed things down" with the grey sweater and denim jacket, I really don't think it reads as "girly" at all. I think it's more "tomboy." Like "Mom made me wear this foofy skirt, but I'll show her!" Ha. Rebel. I recently returned a navy blue ditzy floral sleeveless top because when I got it (which I hadn't realized from the picture online), I discovered the sleeveless armholes were edged with a little frilly ruffle. That, to me, was too girly. Too "sweet." I'm almost 60 years old. I'm not really interested in looking "sweet." Yes, I could have put something over it but I'm trying to not buy things that can only be worn "while hidden." Rebelling against this skirt? I think you could be right! I'm not a big fan of ditsy florals ... I like a mid-sized floral and love them big and bold! I have a few "okay with a cardigan over it" things too. I bet LOADS of people can relate to that! Love your blog! I wanted to ask you about skirts -I am a young looking 63, 5’2”, long waisted, 135 lb , not thin hourglass figure. I always struggle with what length and style would make me look slimmer and taller-any ideas please??? Missed the notify me box, so ticking it now! You're lucky to have a lovely long waist! All of the trends at the moment are 'cropped' length of tops and jumpers (not actually cropped, just meeting the waistband of your bottom half). A long waist is perfect to pull off tucked in and 'cropped' looks which also make you look taller and slimmer. Try pairing higher waisted skirts with these styles of tops. The higher waistlines will make you appear longer of leg! Any length of skirt is great, it depends on your legs and how you feel about them... if in doubt, just below or on the knee is easiest. Wear whatever floats your boat and makes you happy... ignore the rules. Try a few different styles when shopping and always take a total curve ball into the changing room... something your would NEVER normally pick. What's the worst that can happen? You don't like it. You might give yourself a giggle OR you might find something unexpected that makes you feel fabulous!! great ideas, thanks so much for taking the time to respond! At 63 I am only now being 'born' into the fashion world -I was a stay at home mom of 4 and when they were launched I became a full time artist (painter) so never really saw a need before now. 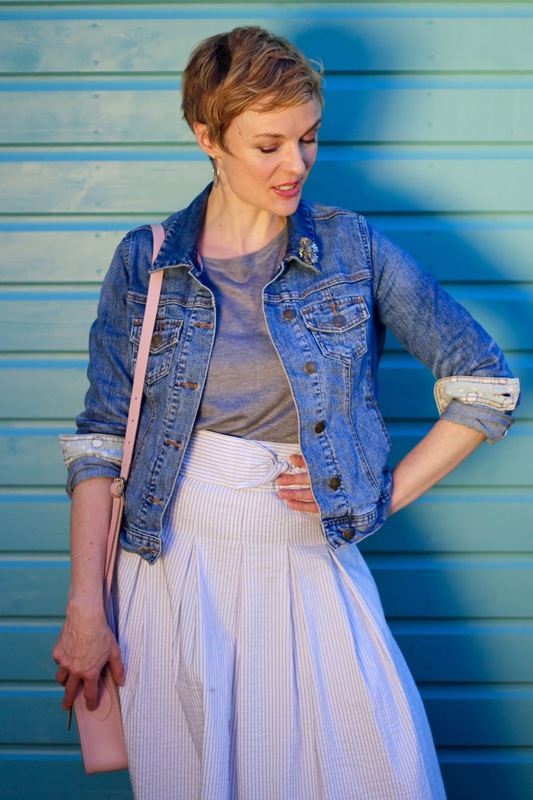 But as I age I want to look nice and not frumpy, so have dove in with both feet to fashion, which is how I found you -actually it was through Hilary Rushford's Style and Styleability workshop, which I am REALLY enjoying. That's great to hear Sharon! It's certainly never too late to "get into fashion"... in fact, being older has it's advantages... we care a lot less about what other people may think!! well, you totally rock in your girly skirt, so puffy and cute!, and I agree on denim jackets, they go with everything!. And your satchel is a perfect accessory! I love how you make this feminine piece work into your own style and look 100% You, so fabulous! I wish I had the skills to split a seam and add them in... that would be great. Well, I'm 48, and this is a look I wear on a regular basis! I've been told I'm 'gamine' (both in looks and personality), which delighted me, as it means that I can wear styles that read as 'young', as long as I don't go too girly and frou-frou. 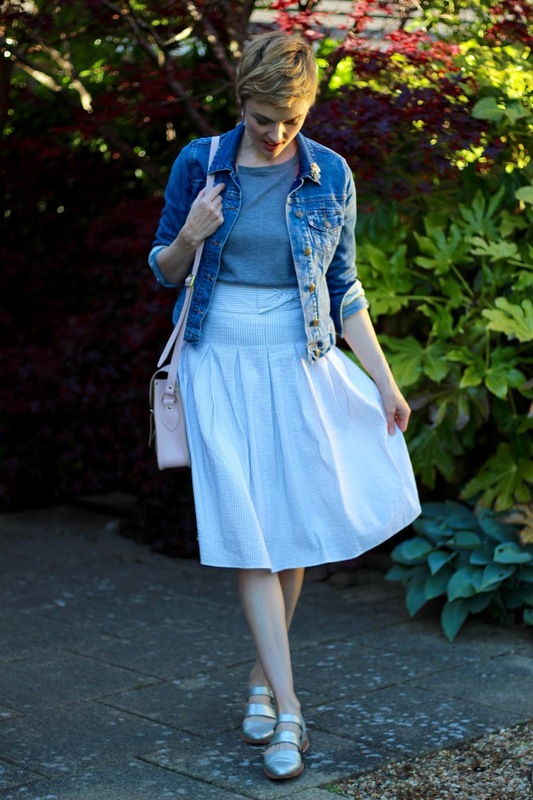 So, I tend to do what you have demonstrated so effectively here - I'll team a poofy skirt with something boyish or androgynous (a denim jacket is indeed the perfect partner), to keep it cheeky and fun, rather than venturing into cute and sweet territory. If I might say, I think the gamine look suits you perfectly too! Gamine is such a lovely word Fran! It reminds me of the gorgeous Audrey Hepburn. You are right about avoiding "cute" and going for cheeky! I love me a subtly poofed skirt, especially one that's slightly drop-waisted or scooter-shape (like yours), and the shorter the better GRIN I think the problem lies in drawing the line between feminine girlish (gamine) and cutesy a la borderline kiddy. The balance you've drawn here is quite perfect, Sam. Hard + soft + a wow factor in those shoes. Very nice!!! Ooh, I am a sucker for a pouffy skirt - that one is lovely, Samantha. I'm over 50 and I get my girly on all the freakin' time! Screw what anyone thinks! I adore those silver shoes - great choice. Pockets are something that every skirt, pant and dress should have! They are a very important symbol of women's independence and ownership of ourselves (as opposed to being "owned" by men way back in the day!). Prior to that, women didn't carry possessions (because they weren't allowed to own things! imagine! ), so if they had to carry something it was on a chatelaine, like a little key chain that you wore on the outside of your clothes, maybe like a little notebook or sewing kit. Pockets symbolize women owning things and not having to display them - and that is why pockets are so important! Gosh Sheila, I hadn't made this association! I have read about fashion history and knew about the items hanging outside of the outfit but hadn't thought to much about the social aspect of it. I'm going to get my books out and have another look today. Thank you for this fab comment!! My husband and I recently started taking some ballroom dance lessons. Tonight I wore a similarly styled skirt in a subtle paisley print and it was perfect for dancing. Dressing for this class is as much fun as the dancing itself! Getting dressed up is just as much fun. Your dance classes sound great fun! Is your hubby a good mover? I absolutely love the girliness of this skirt, Sam. But I must agree, it would have been utterly perfect had it had a couple of pockets. I do love pockets on skirts and dresses. Love this skirt on you! So fun and spirited a look! well, you know by now I love feminine looks.. and this has the mix of classic and feminine, with the solid top and denim jacket.You look lovely! 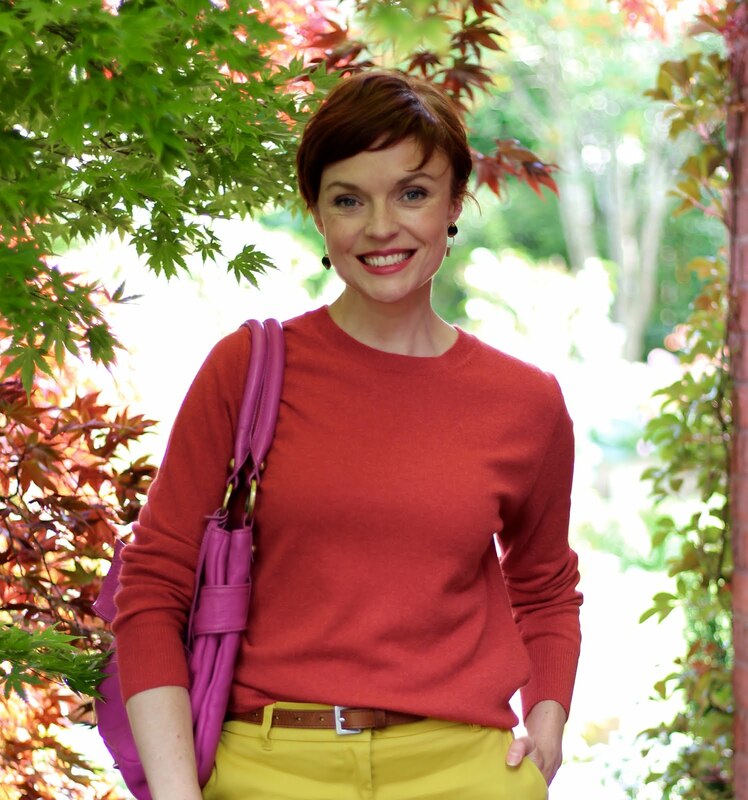 Blimey Jess... you are the Feminine-outfit Queen and do it SO well!